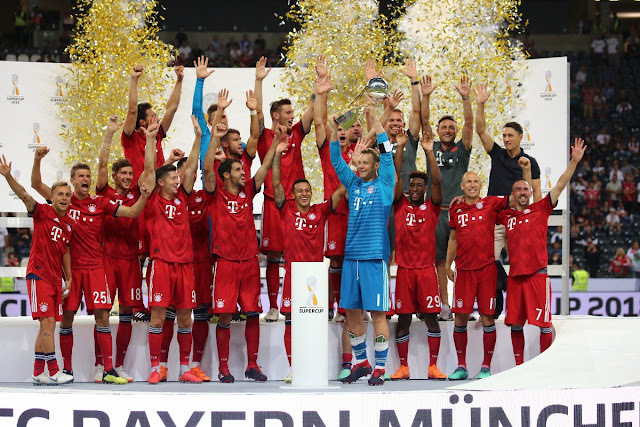 Robert Lewandowski scored a hat-trick as Bundesliga champions Bayern Munich thrash Eintracht Frankfurt 5-0 to win the German Super Cup. The 29-year-old Polish striker scored twice with headers in the first half and completed his hat-trick with a powerful shot 10 minutes before the half-time break. Kingsley Coman and Thiago Alcantara were the other scorers as Bayern ran riots to retain the cup. There have been doubts about Lewandoski's future at Bayern Munich, but manager Niko Kovac has revealed that the club "won't let him leave". Bayern's next match is against Drochtersen/Assel in the German Cup on 18 August. After that, they will play Hoffenheim in their first Bundesliga match on 24 August.